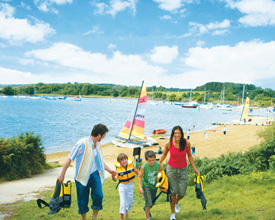 Overlooking Poole Harbour, Rockley Park exploits its position with a reputation as a water-sports oasis. Perhaps that's one reason for its 5-Star rating awarded by the English Tourist Council. Others include beautiful landscaping, a nature reserve and a fabulous pool complex with sun terrace. But pride of place must surely go to the luxury Spa, which offers a wide range of health and beauty treatments. Feel free to fill each day in just your own way - Maybe a lazy lie in or a family Wake 'n' Shake session? It could be a morning in the new indoor SplashZone Grotto, or why not give abseiling a go? Feeling peckish? Lunch out at one of the fantastic Dorset pubs, or pop into our the Mash & Barrel Bar and Cafe' on Park. After a bite to eat, try the Watersports School, or go out and explore Dorset. 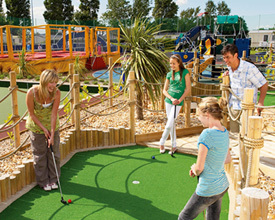 To wrap off the day, enjoy a stroll on the beach, or a game of crazy golf. Then head off to the ShowBar for a drink, live music and dancing. So, whether it's out and about or staying on the Park, you're sure to have a great holiday at Rockley Park. 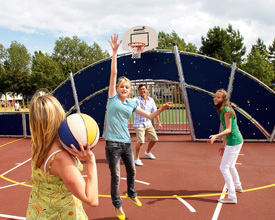 Rockley Park Holiday Park offers the following facilities. This spectacular Five Star Dorset Park has views over glorious Poole Harbour and is well located for exploring the breathtaking coast of the county. Beautiful harbour towns and dramatic rocky cliffs are the essence of this coastline. So many beautiful rural attractions - those picturesque Dorset villages, the dramatic coastline, plus the coves and beaches that surround this Park. Take a boat trip on the harbour and enjoy seeing Portland Castle as it was made to be seen, built to defend Weymouth against possible French and Spanish invasion. Its squat appearance is typical of the castles built by Henry VIII in the early 1540s. Dorset is famous for Monkey World, boasting the largest group of chimpanzees outside of Africa while Poole itself is well know for its pottery and bus tours of the nearby New Forest. And not forgetting that nestled in a sheltered bay, Bournemouth's seven miles of safe, sun-kissed beaches are perfect if you dream about long, lazy days by the sea. 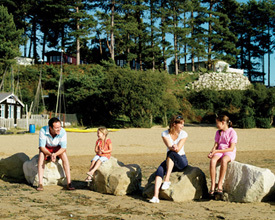 Have you been to Rockley Park Holiday Park? Please submit your review so that others can benefit from your experience. Important note: Information provided here about Rockley Park Holiday Park is based on our best knowledge. However, please check with Rockley Park Holiday Park before booking to ensure that you have the information required. 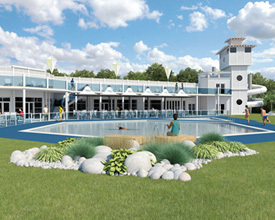 Reviews are the sole views of the contributor and do not necessarily represent the views of CampsitesandCaravanParks.com or Rockley Park Holiday Park.